Zochem Launches New Zinc Oxide Website - Zochem, Inc.
ZOCHEM, a leading zinc oxide manufacturer has just launched a comprehensive new responsive website. The site utilizes the latest website technology to provide a superior usability experience on any type of web device. 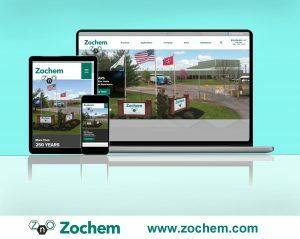 DICKSON, TENNESSEE —ZOCHEM, a leading zinc oxide manufacturer has just launched a comprehensive new responsive website. The site utilizes the latest website technology to provide a superior usability experience on any type of web device. Zochem LLC is a major North American producer of zinc oxide, headquartered in Dickson Tennessee. The company operates technologically-advanced plants in Brampton Ontario and Dickson, TN. Both facilities manufacture zinc oxide for industrial and consumer products. The “French Process” method is used exclusively, as this method produces zinc oxide with the most consistent quality and highest purity. According to Zochem VP of Sales and Marketing, Ed Smith, “as we recently combined the resources of two leading zinc oxide producers, we wanted to showcase our capabilities with an all-new website. No matter what type of Internet device is used, the site provides quick access to product and certification documents, company capabilities, local sales contact information and much more.” In addition to information on the company, the site displays recent zinc prices from the London Market Exchange (LME).